Today was to be our diving day. It’s the highlight of the day, and a highlight of the trip in many ways. We left early,around 8:30am, and proceeded to do two dives. We saw many things, usual stuff we’ve seen before, but I just need to jump to the HIGHLIGHT of the dive (highlight of ALL my dives put together in fact), the shark. In the middle of the dive, with the reef that slopes down deep into the open ocean on our right, and the deep blue on our left, we were instructed to keep an eye on both sides, the right for reef activity, and the left for pelagics, or open water big fish. Our dive instructor suddenly stopped finning, then gestured for us to stop. He made the unmistakeable hand signal for “shark”, which is basically putting your hand on your forehead, like a shark’s dorsal fin. A cold chill mixed with electric excitement ran through my veins. Although I’ve yearned to see a shark all my life, I’m still deathly afraid of them, a deep-seated fear, seeded my multiple viewings of “Jaws” as a kid and “Shark Week” on Discovery. From the distance, we saw the characteristic shark shape, a menacing torpedo armed with sharp fins and even sharper teeth. But it was too far away to be any more than a blurry silhouette, and it slowly disappeared into the open blue. Just when we thought that that was that, we were startled to see it suddenly appear on our right, by the reef, and so close to us! 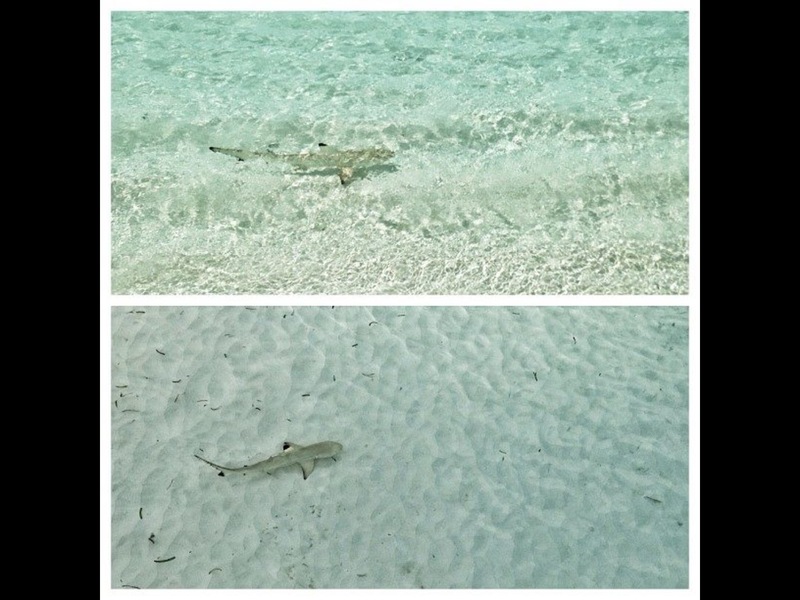 It was a large gray reef shark, about two meters long, way larger than the usual black tip and white tip reef sharks we’re accustomed to seeing. It was the first “real” shark I ever saw. It was swimming so close that I could see its cold steely eyes gazing at me, probably figuring out if I were edible or not, and its mechanical unfeelingness was fascinating and fearsome to behold. It was the first sea creature that wasn’t afraid of us. I told myself if it started circling any closer, I’d ready my camera to go between me and its mouth. Thankfully, after circling a couple of times, each circle closer to us than the previous, it lost interest and swam away. My heart felt like it was going to leap out of its cavity! So excited and so scared at the same time! Our second dive was the “turtle airport”, the Kuredu caves, and we encountered so many turtles, but I guess anything after the shark seemed diluted in comparison. On a side note, I was so happy to have taken a video of most of the highlights of the dives, yes including the shark, and now I can’t wait to start editing it and finally posting it on YouTube! This place just keeps on giving, like a giant artichoke, and each layer you peel off gives a wonderful surprise. I don’t know how we can top this holiday, this one already exceeding by miles, all others put together.